Why just party when you can party with a purpose? Seventeen-year-old Lulu Cerone shows teens how to bring social activism into their daily lives—and have fun while doing it—with this colorful DIY party planning guide perfect for every socially conscious kid! PhilanthroParties are “parties with a purpose.” In 2010, then ten-year-old Lulu Cerone was deeply affected by the earthquake in Haiti. She set out to raise money for Haitian relief by selling lemonade, but she upped the ante on the classic lemonade stand: she got her entire class to participate, boys against girls. Their lemonade “war” raised $4,000! Now seventeen, Lulu is bringing her message of social activism to kids and teens around the world, showing them how to have fun while taking action, giving back, and generally having an impact on the world and the communities they live in. Having a birthday? Invite your guests to bring a toy to donate to a local charity instead of presents. Earth Day coming up? Host a Guerrilla Gardening party where guests make seed bombs with native flowers and throw them all around their neighborhoods for some drought resistant greenery and color. Want to have a movie night? Invite friends over for National Popcorn Day. Watch movies, snack on some wildly delicious popcorn, but give the party a philanthropic twist by asking everyone to bring old DVDs and Blu-rays to donate for soldiers overseas. This creative DIY guide gives readers what they need to know—from inspiration to how-tos—to incorporate philanthropy into one’s social life. It includes party ideas and plans, event checklists, recipes, crafts, personal stories, and brief profiles of causes readers should know about. 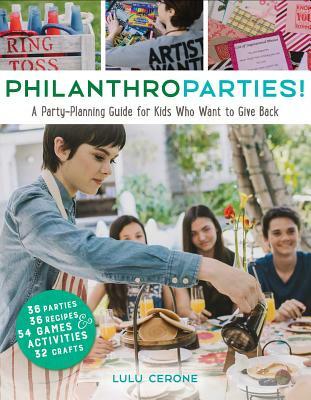 Organized by month of the year, the book features thirty-six PhilanthroParty concepts paired with vibrant photography and colorful design, to get kids started. Whether they are in their schools or in their communities, individually or in groups, kids and teens can make a difference and inspire others to do the same. Whether helping citizens in local or global communities, PhilanthroParties become a valuable pathway to peace, which is so very needed in our world. As young people (and adults) tend to the basic needs of neighbors near or far, they are helping them be “okay” in life, despite challenges. And through this philanthropic outreach, youth are empowered—realizing that they can tangibly help make our world a better place. Lulu Cerone has done an incredible job in sharing how young people can learn about their world and have fun while supporting others through materials and fundraising, and kindness, compassion, and companionship. This book is a great gift for any young person (and for adults as well). And better than that, it then becomes a gift to all global neighbors who will in turn be celebrated and supported by each PhilanthroParty. "A guide to planning gatherings that raise awareness and solicit donations for a variety of social causes, written by a Los Angeles teen who founded a philanthropic organization and advocacy group called LemonAID Warriors. Employing a conversational, personal yet pithy tone, this guide begins with an introduction that gives some background on how Cerone became involved with social activism and how she came to work the hosting of parties into the mix. Organized in a calendar-year format, each month features a list of potential national celebratory events and then expands at length on three of the themes, giving a blueprint that includes details such as crafts, activities, recipes for snacks, playlists, and fundraising ideas. Photos of these events feature diverse groups of partygoers and embellish this appealingly designed guide, though some of the assumptions made—that friends invited to a pre-prom shindig will have old dresses to donate, for instance—suggest that the imagined audience is predominantly middle and upper class. There are also some elements that meld awkwardly, such as the glib description of an "I Have a Dream" board constructed for an MLK Day celebration as "super-cute." However, Cerone is also careful to advise teens to spend time researching and thinking out their ideas, offering this valuable caveat: "What might seem like a good idea in the moment could create challenges for the people we are hoping to help." This useful and accessible how-to of creative projects and tips will inspire altruistic preteens and teens." Eighteen-year-old author Cerone leads by example as she encourages readers to dive into grassroots philanthropy and social awareness: at age 10, she used a lemonade stand business to raise money for victims of the 2010 Haitian earthquake, then went on to develop the nonprofit organization LemonAID Warriors. In the book, Cerone offers 36 suggestions for activism-themed “PhilanthoParties,” three for each month of the year, which are often tied to holidays and celebrations: “Guerilla Gardening” for Earth Day or a can drive for Hunger Month in September. Recipes, crafts, and games are included, and her enthusiastic writing and the photo-heavy layout emphasize keeping the fun in fund-raising, while also encouraging readers to pursue their own passions and causes.